Five doctor visits, three prescriptions, numerous grocery store trips for more Pedialyte and one late night drugstore run for a new vaporizer later, those doe eyed days seem like a story I read somewhere. Oh right. I read it in my head. Everyone says that by the time my kids get to kindergarten they will have super tough immune systems because of this. I worry extra that my CP son will have difficulties with an infection in his shunt. There are days I feel like a super tough parent. There are days I don’t. This day I did not. It’s super tough to get six people over that much illness all at once. 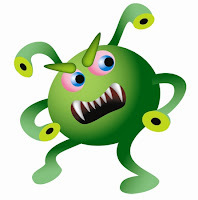 Viruses don’t respond to antibiotics. They are super tough. I’m going to have to become a virus. Hopeful Parents - How Am I Supposed to Feel?